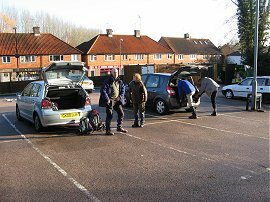 We did this walk on Sunday 17th January 2010 with five of us setting of from the car park in Hartfield Road, Forest Row, photo 1, where we had finished the last stage of our walk along the Vanguard Way. 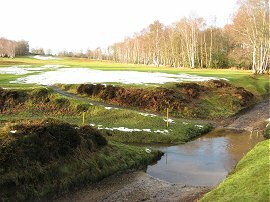 It was a bright fresh day and with the remains of the recent snow still lying on the ground in a number of places. From the car park we headed down the Hartfield Road before heading to the right along Chapel Lane. We had gone slightly off course at this point as the official route as marked on the map takes a slightly shorter route to Chapel Lane, heading diagonally across a green by School Lane and then joining a footpath that heads to Chapel Lane between houses. Back on the correct route we headed uphill along Chapel Lane before heading to the left to join a track running along the edge of the Ashdown Forest Golf Course. The route follows this track before reaching a band of trees and anyone who looks at the GPS route at the bottom of the page will see that once again we managed to head off route. The actual path heads half right through the trees however we headed to the left along a very muddy footpath running between houses which we followed to Park Road. Here we turned to the right following the road into a cul de sac. Realising our error we then retraced our steps back along the muddy footpath for a second time before turning to our left and continuing on through the small band of trees, before heading to the left to reach Primrose Lane. The route heads down the lane for a short distance before heading to the right along another track where we gingerly crossed over a stream, photo 2. 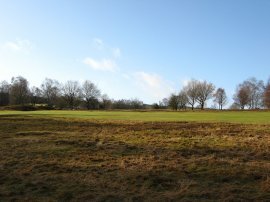 Continuing ahead, the track soon reaches the golf course again, photo 3, and the Vanguard Way now meanders its way alongside the fairways of the course for some distance, generally following the left hand edge of the course. After a fairly long straight section where the path heads steadily uphill alongside a fairway, photo 4, sometime running just inside a band of trees, the route leaves the golf course along a path on the left. This is followed as the route heads through an area of patchy trees to reach Colemans Hatch Road, although on Multimap this is named as Ridge Road. Incidentally, this is the second time recently where I have come across naming differences between Google Maps and Multimap. Heading across the road the path heads to the right before bending round the edge of a bowling green which approached from the side we came from seemed to be located in the middle of nowhere. 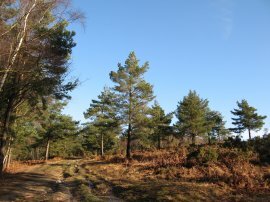 The Vanguard Way then crosses over another minor road, Sandy Lane, and heads alongside the edge of a cricket pitch before joining a path that crosses an area of heath land interspersed with trees with the higher ground of Ashdown Forest ahead. The path reaches a thicker area of trees near some houses where the route heads to the left to join a track that runs down to reach a road, Kidds Hill. Here the Vanguard Way heads to the right along the road before turning to the left along Chuck Hatch Lane, the route crossing a footbridge alongside a ford. Once over the stream the route soon joins a broad footpath on the right. This path starts heading uphill along a grassy path, photo 5, the path becoming much more muddy and uneven as it becomes surrounded by woodland on both sides. Approaching the top of the hill the track reaches an open area on the left, photo 6, where the route heads to the left along a track running along the edge of the trees. 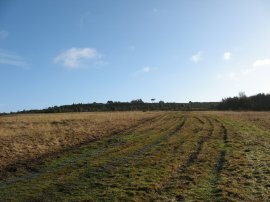 After a short distance the route then joins a path on the right that heads across the open area of ground still ascending uphill. 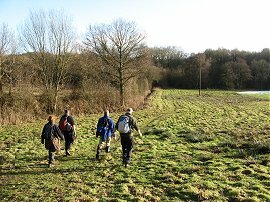 After a short distance the route then joins a path on the right that heads across the open area of ground, photo 7, still ascending uphill. The path bends slightly to the right to heads through a small section of trees before once again heading over more open ground to reach a track close to the top of the hill from where there were good views back over the way we had walked, photo 8. 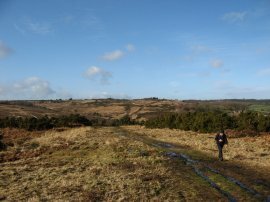 Here we turned to our right, heading along the track to a small parking area at the junction of Kidd's Hill and the B2026. Here the Vanguard Way crosses the road continuing ahead on a track that bends to the right to run parallel with the B2026 on a fairly level path running over the top of Ashdown Forest. Heading down this stretch of path we crossed over the route of the Wealdway that we had walked in 2009 before reaching another small parking area. Here the route runs alongside the B 2026 road for a short distance to its junction with the B2188. Heading over the B2188 the route passes round the edge of another car park before taking another grassy track on the right, running over the open heathland of Ashdown Forest. 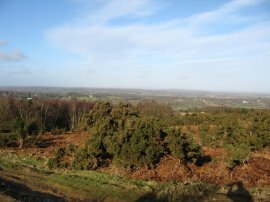 We headed past the trees of the Kings Standing Clump and then yet again we managed to deviate from the official route of the path, heading too far to our right, and thus we had to make our way to the left across a trackless piece of ground to rejoin the correct route, photo 9. This section of path if followed down to join a track close to the edge of the Ashdown Forest nr Crabtree Farm where the route heads to the right. This track which, like most of the tracks over the forest, was quite wet and boggy with standing water on the surface of the path. The path starts heading downhill to cross a couple of small streams and we stopped at a convenient pile of logs besides the path which gave a dry surface for us to sit on during our lunch break. Once over the streams the route regains height as it heads up to reach the A26 in Poundgate, once again opening up views over the paths we had just been walking, photo 10. The route then heads to the left along the road for a short distance before joining a footpath on the left. This is followed past the front of some houses before joining a field edge path. The route heads to the right across the field which was being grazed by sheep when we went by, before turning to the left to run alongside some trees. The path then runs through a small patch of trees before heading down to join a track near Stroods House Farm. 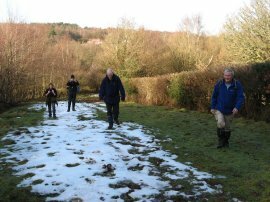 Crossing the track by an a large ice covered pond the Vanguard Way heads alongside a field passing in front of the farm building before joining a footpath on the left, photo 11, where there were another few small patches of snow alongside the field edge. Reaching the end of this field the route bears to the right across another field, heading downhill with good views ahead over a small valley of the river Uck. 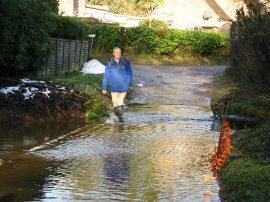 The route joins a footpath that crosses the stream and then heads up a number of wooden steps to a track which leads onto Chillies Lane. 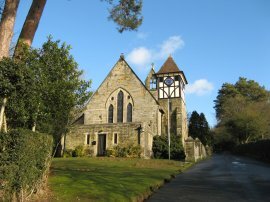 Here the Vanguard Way heads to the right along the road before heading uphill to the left along a road that runs uphill towards the rather unusually styled Holy Trinity Church in High Hurstwood, photo 12. 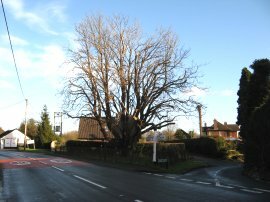 Just before the church is reached the route joins a footpath on the left that runs over a field and then joins a footpath that runs past a house to reach Burnt Oak Lane. The route heads to the left for a short distance before joining a track on the left that heads down past a farm to reach Royal Oak Road which the route follows round to Holders Farm. This must have been a rather dull part of the path because in 40 minutes walking from the Holy Trinity Church I only took one photo. Reaching the farm buildings the route joins a footpath on the left that heads through a small band of trees before entering a field. Leaving this field the route is marked as heading diagonally across the next field however we headed to the right along the bottom edge before heading to the left at the field edge to reach Fowley Lane. 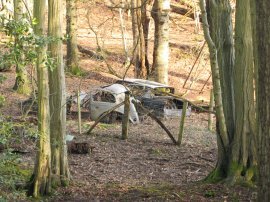 Here we headed to the right along the road for a short distance before heading into a field on the left where I spotted a couple of old abandoned cars, photo 13, in the trees to the left. 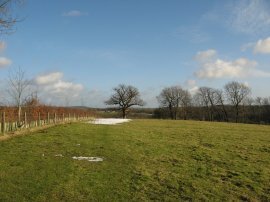 The path heads along the bottom of a field that slopes up to the right, photo 14, before crossing a small stream and heading into a small band of trees where the route heads slightly uphill along what was a very muddy section of path to reach a brick archway under the railway line that runs to Uckfield. Once under the railway the route crosses over another field, then runs alongside some trees to join a track. This track, Redbourn Lane is then followed down to the A272 at Pound Green, photo 15, where we finished this stage of our walk along the Vanguard Way; the cars being parked in a layby a short distance down the road. Reaching the cars at Pound Green we had walked 12.1 miles. 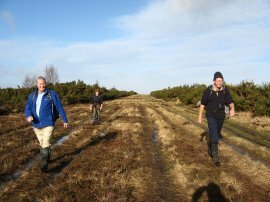 This had been quite a strange walk as whilst I can remember the first half across Ashdown Forest in clear detail I can recall very little of the second half of the walk which was not helped by taking so few photos. At least the GPS route shows where we walked, I'm not sure I would have remembered the route otherwise.